We just learned about the famous painting The Scream of Nature by Edvard Munch. 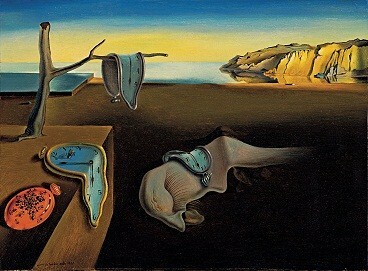 Another very famous painting is called The Persistence of Memory by the artist Salvador Dali. His painting was very strange looking, almost like something weird out of a dream where things are melting. This painting was using something called surrealism which kind of means taking things from our dreams or imagination and making real looking pictures out of them. The painting has pocket watches that look like they are melting. Some people think this painting says something about the way we think about time. Is it really as simple as we think, where clocks just ticks on every second? Or can we bend time, mush it around, speed it up or slow it down? Salvador Dali said he thought of the idea to paint them that way by watching some cheese melt in the sun.